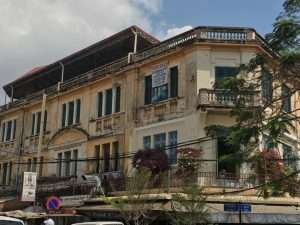 The one unmissable sight, of course, is the Tuol Sleng Museum of Genocidal Crimes (also known as School S-21), just southwest of the centre on the corner of Streets 113 & 350 (daily 7am-5.30pm, US$3) – you should definitely take an audioguide (US$3) or a guide (US$6). It’s very well presented, with lots of photos – like the Nazis, the Khmer Rouge took records of everyone, even if there was next to no chance of their not being killed. You may even meet one of the very few survivors – see below (some say just seven prisoners were left alive when Phnom Penh was liberated by the Vietnamese, some say that up to 200 survived in one way or another – but there’s no doubt that between 12,000 and 20,000 took the one-way journey from here to the Killing Fields). Yes, it’s harrowing, but if you do it properly you can then allow yourself not to go out to the Killing Fields as well. The National Museum is worth visiting for US$5, mainly displaying Khmer sculpture from the 6th century on, as well as some ceramics. Next door, the Royal Palace (including the Silver Pagoda) keeps slightly erratic opening hours – we found it closed for some royal event or other. Just north of the centre, Wat Phou (daily 7am-6pm, US$1) is not particularly interesting, but it’s near some French colonial buildings which will be very attractive when they’ve been refurbished – on the post office square there’s also the Hôtel de la Poste (1890s) and, at the north end of the square, the former police station (c.1910), which may reopen as a boutique hotel at some point. There are some lively bars in this area too! Khmer Architecture Tours offer tours on Saturdays and Sundays – it’s also worth seeing some of the buildings designed by Cambodia’s best-known architect, Vann Molyvann (1926-2017), such as the National (or Olympic) Stadium and the National Theatre. 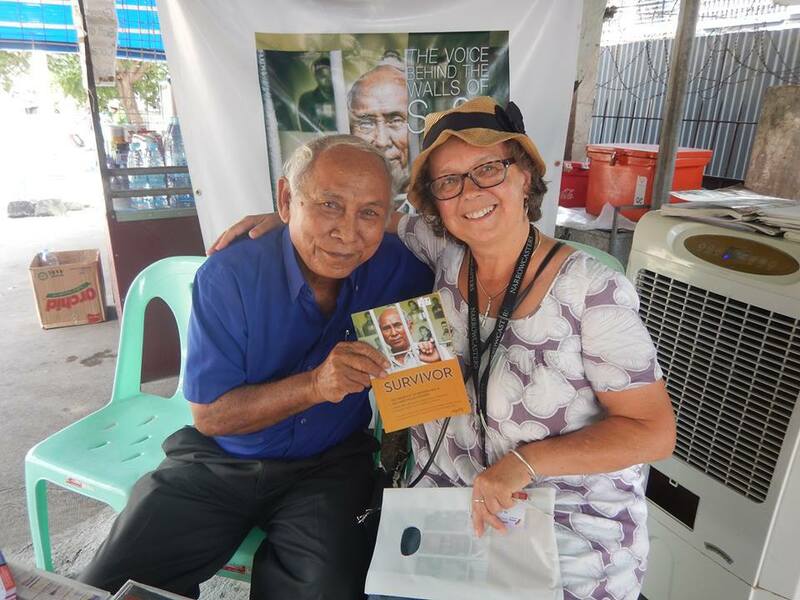 I was very grateful to be able to meet Chum Mey, one of only seven known survivors of the S-21 Tuol Sleng Camp, who has written about his experiences there in the book SURVIVOR which raises funds for those in poverty. As we wandered thru’ Laos and Cambodia we noticed more and more cats and kittens without tails or with stumpy tails or tails with a kink. Was there some strange cruel tradition of tail deformation at birth and if so, why? As it turns out, after a fair bit of googling I discovered that this phenomenom is due to a recessive gene! 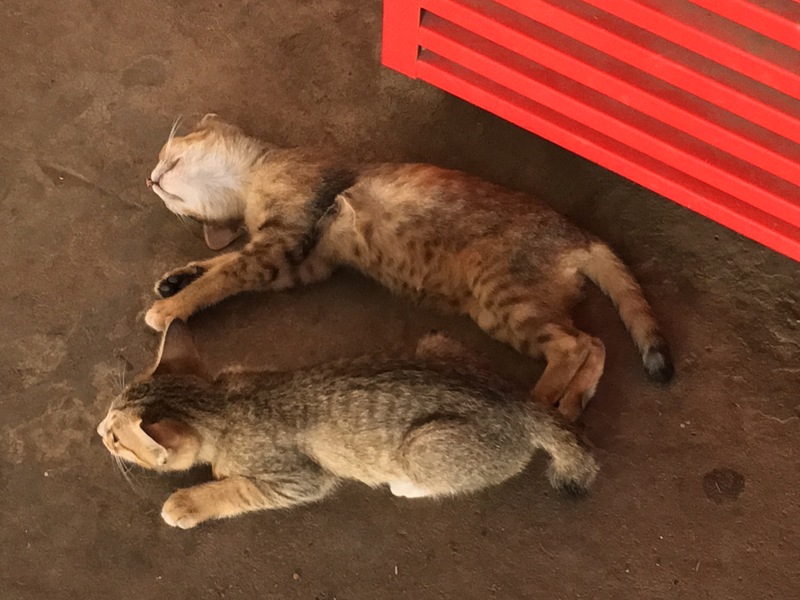 There is a short-tail gene which is carried by Japanese Bobtail cats and Siamese cats whose naturally short, kinked tails have been bred out in Western countries, but has spread all over Asia helped by in-breeding between stray cats. 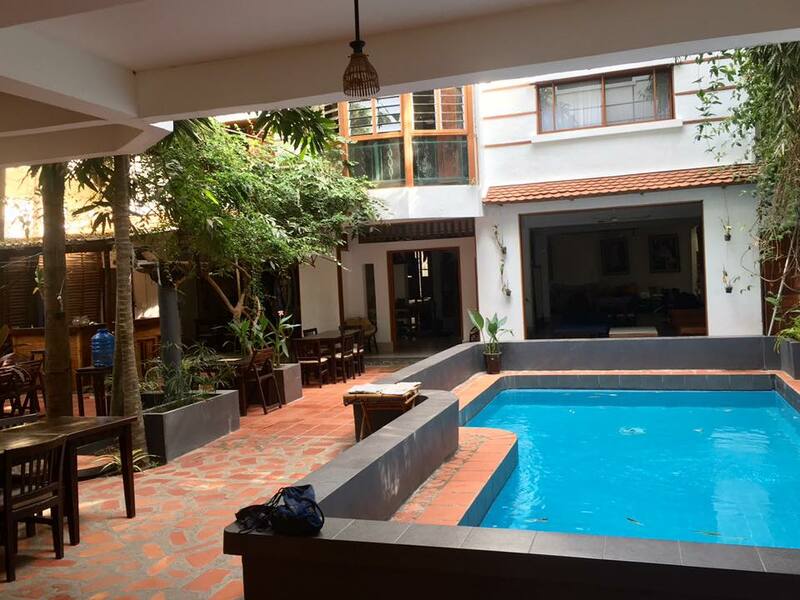 You Khin House is a peaceful and comfortable place to stay away from the hustle and bustle of the city streets of Phnom Penh. It provides the best of any B&B with many additional advantages, not least that the whole operation exists to support disadvantaged children. 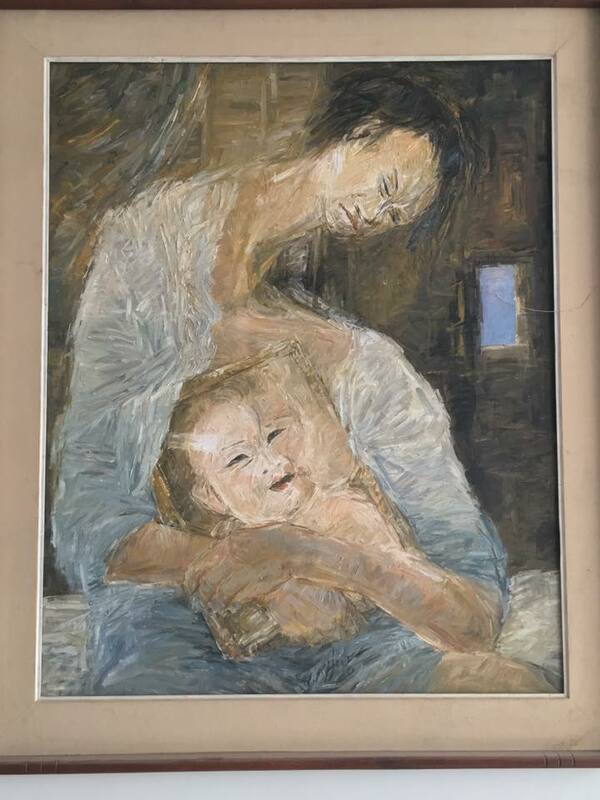 It was created in 1990 by Mrs Muoy You and her late artist husband who designed the building, which also houses a collection of his paintings. Funds generated support underprivileged families who are offered a quality education for their children to help break the cycle of poverty. By staying at You Khin House you are supporting the running of a Montessori nursery and a primary school 30km south of Phnom Penh. Rooms are behind the courtyard so very quiet apart from the squawk of a resident cage-bird! There is a small pool in the internal courtyard where a cafe serves fresh food all day, and in the evening, prepared by three local women. The breakfasts are delicious and varied and included fruit and pancakes. There is a second street-side building which is currently in development and will provide affordable apartments for people staying longer than the average tourist. A lovely home from home. There’s also at least one tuk-tuk driver usually just outside the front door for convenience! 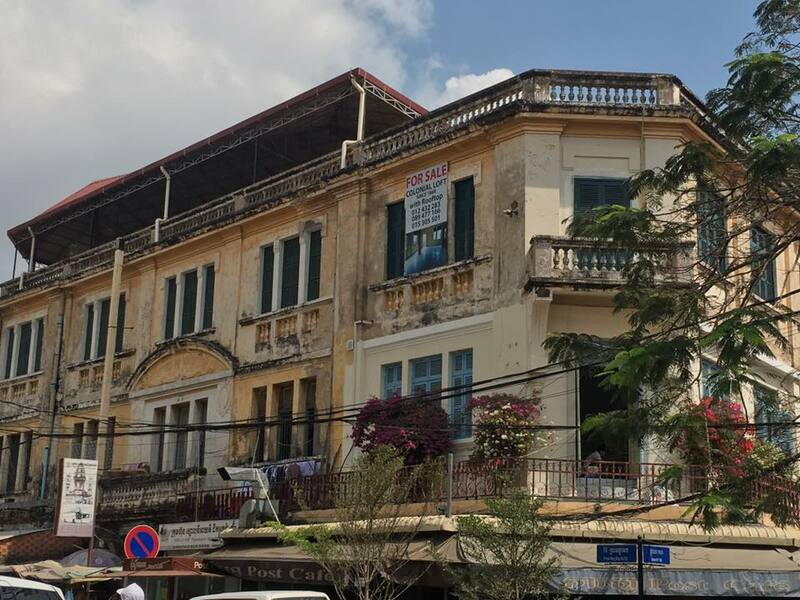 There are a couple of very special restaurants in Phnom Penh, run by Mith Samlanh, the Cambodian branch of Friends International, which was set up here to help the 10,000 or 20,000 children left living on the streets after the Khmer Rouge nightmare. The restaurants both raise money and provide training for youngsters wanting to work in the hospitality business. We ate at Romdeng, serving fascinating Cambodian dishes (with plenty of vegetarian options); it’s an attractive villa with tables on the patio and by the swimming pool, and food and service are both great. It would be wise to book in advance. They also have their original, less fancy, restaurant, Friends, which produces food for their training centre, and more recently they’ve opened Marum in Siem Reap and Makphet in Vientiane, which like Romdeng are aimed at tourists and expats. However in March 2017 it was announced that Makphet had to close temporarily due to the expiry of its lease. Although Thai- and Vietnamese-style food was all that was available when the founders of Friends International first came here, and it’s easy to assume that Cambodian cuisine is something in between the two, it’s actually distinct from them. Many dishes are based on prahok (fermented fish paste), but otherwise meat and fish play a minor rôle. Chillies are usually served on the side, so it’s not too hot. Tamarind is important, as well as galangal (part of the ginger family), banana flowers, unripe mango, amok leaves, morning glory (water spinach), winter melon, and lotus root. I learnt this from the Romdeng cookery books, which are fabulously produced but very heavy – luckily they can be bought online when you get home. Incidentally, there are stalls in a few locations across town that offer delicacies such as grilled beetles, spiders and even snakes. We also stumbled across the Himawari Microbrewery, in a big new hotel right on the attractive promenade by the Mekong – just like the Siem Reap Brewpub, they produce a range of golden, IPA and stouts, with a US$4 flight of samplers available, and they also do pizza. The beers were perfectly acceptable but to my mind they seemed just slightly blander than the Siem Reap offering.